The National Highway Traffic Safety Administration (NHTSA) reports that 10 percent of all injury car accidents in the year 2013 were caused by distracted drivers. There are many forms of distracted driving and all of them can result in a serious accident. Victims of distracted drivers should immediately seek legal guidance from our skilled New Hampshire personal injury attorneys who will work diligently to obtain fair compensation and hold the at-fault motorist accountable. Any time a driver removes his or her focus from the task at hand there is the potential for a distracted driving accident. Distracted drivers may be held liable for the injuries they cause in addition to being cited by police for their negligence. In New Hampshire texting while driving is a "primary offense." This means that an officer can pull a driver over for texting or using a cell phone or any data entry device while driving even if there are no other offenses being committed. The statute is written to prohibit an individual from driving a car and making calls or writing a text message, simultaneously. In 2015 the “Hands-Free” law went into effect in NH, barring any hand-held device usage while driving. Drivers can, however, use Bluetooth hands-free connections to devices. 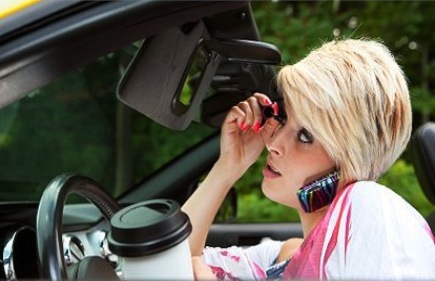 Any driver with a cell phone held up to his/her ear will be presumed to be making or taking a call. A distracted driving conviction is a violation level offense. New Hampshire RSA 265:105-b is the new hands-free statute. According to a study published by The University of Utah, using a cell phone while driving can delay a driver's reaction time as much as driving while under the influence of alcohol. The NHTSA reports that in the year 2009, 18 percent of all distracted-driving-related fatal crashes involved a cell phone. During that same year, the age group most at fault for distracted driving accidents was drivers under the age of 20. The Insurance Institute for Highway Safety (IIHS) reports that drivers using hand-held devices are four times as likely to get into accidents. In fact, a report by Fatality Analysis Reporting System (FARS) and General Estimates System (GES) showed that 5,474 people were killed and approximately 448,000 were injured in distracted driving car accidents in the year 2009. If you have sustained injuries caused by a distracted driver contact a skilled NH car accident injury lawyer today. Our lawyers will pursue compensation for your medical bills, lost wages, pain and suffering and other related damages. The experienced injury attorneys at Tenn And Tenn, P.A. have a successful track record of holding negligent drivers accountable for the damages they cause. If a negligent driver has harmed you or a loved one, call our offices today at (603) 624-3700 or 1-888-511-1010 for a no-cost consultation and a comprehensive case evaluation.